The eighth generation of the Hyundai Sonata was revealed online a few weeks ago and will make its first public appearance at the 2019 New York Auto Show on April 17. The Car Guide recently had the exclusive opportunity to take the car for a spin around Seoul, Korea. 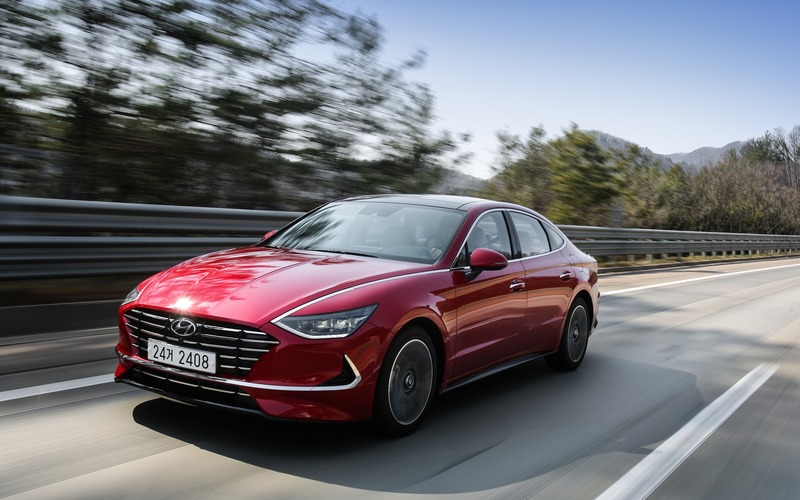 Customers in Canada will have to wait until November to buy one, but don’t worry, we’re more than happy to share our first impressions of the 2020 Hyundai Sonata with you today. 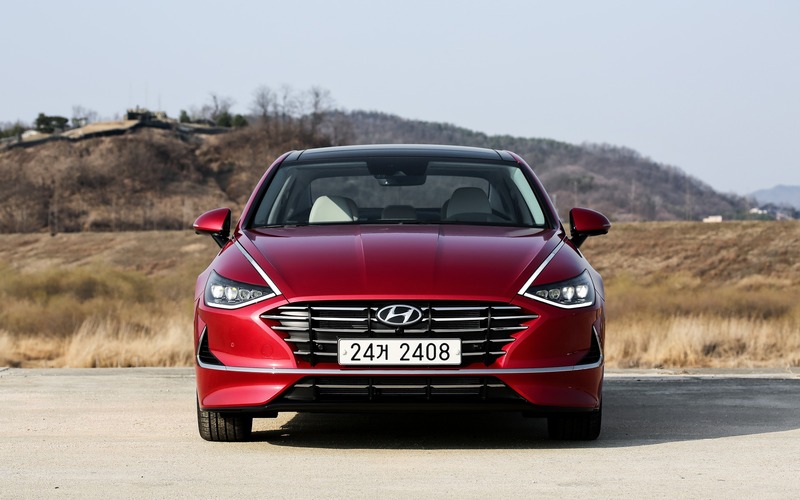 For the next generation of its midsize sedan, Hyundai went with a coupe-like design that emulates the current Audi A5 and A7, thus marking a radical departure from the outgoing Sonata. The first thing that catches the attention is the dramatic, fastback-style roofline, but a close second has to be the redesigned grille and headlights up front, which are heavily inspired by the Le Fil Rouge concept we initially saw in a world premiere at the Geneva Auto Show last year. Hyundai designers made a bold move by stretching the daytime running lights onto the hood. When the car is stopped, said lights stay hidden, but they will come alive as soon as you turn the car on. This unique and fascinating design element produces a remarkable effect and really makes the 2020 Sonata stand out from every other vehicle. On the flipside, you have to wonder about the complexity and cost of replacing such high-tech lights in the event of damage. By the way, there will also be a Sport variant featuring a blacked-out grille, a uniquely styled front fascia and trim-specific wheels. The transformation continues inside where the layout is just as bold as the exterior. 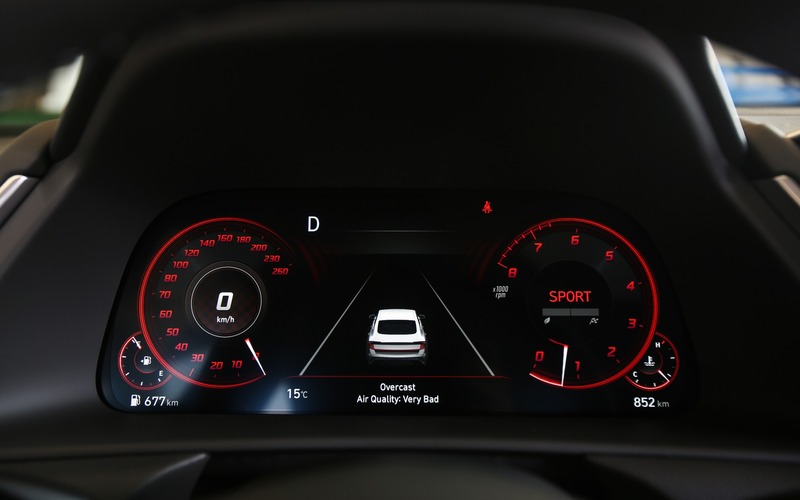 The wing-shaped dashboard is inspired by a stealth aircraft, according to designers, and incorporates a 10.3-inch horizontal screen acting as the main interface for the infotainment system. Meanwhile, the instruments in front of the driver are replaced by a configurable 12.3-inch digital display. The automatic transmission is now controlled via push-buttons, contributing to a cleaner-looking centre console that has the feel of modern luxury cars. Overall, the 2020 Hyundai Sonata is masterfully designed both inside and out. In Canada, engine choices will be limited to a 1.6-litre turbocharged four-cylinder that produces 180 horsepower and 195 pound-feet of torque. You may remember it from its brief appearance under the hood of the Hyundai Tucson. Combined fuel economy for the 2020 Sonata is estimated at 7.6 L/100 km, helped by an eight-speed transmission. South of the border, Hyundai has also announced a 2.5-litre engine rated at 191 horsepower and 181 pound-feet of torque. Don’t get your hopes up for this one, however. Despite the growing trend of offering an AWD option on sedans (cases in point: the 2019 Nissan Altima and Mazda3), Hyundai has decided not to go this route with the new 2020 Sonata—at least for now. You see, the upcoming generation is based on an all-new architecture called N3, which will also underpin future models including SUVs and crossovers, meaning that it is compatible with AWD. Adding it to the Sonata lineup is currently under consideration, Hyundai executives say. Same thing with the hybrid powertrain. 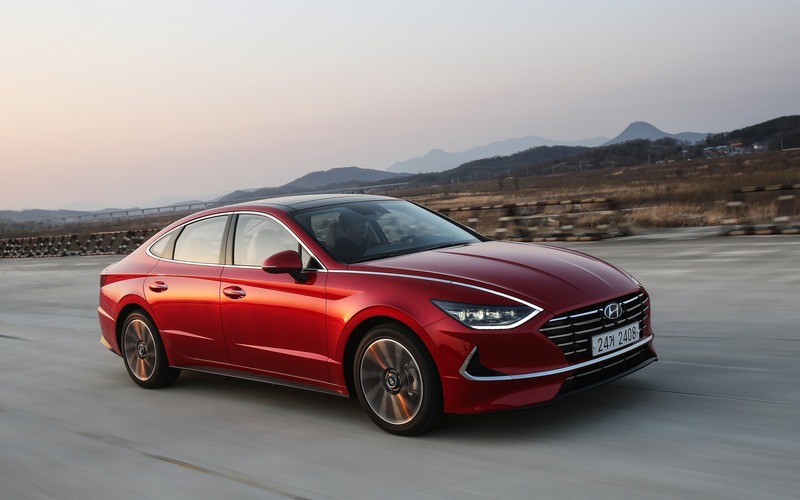 The previous three generations of the Sonata have all been offered in gas-electric configuration in addition to the conventionally powered model (including a plug-in hybrid type for the last two), so it’s safe to assume there will be a 2020 Sonata Hybrid at some point. For our first drive on public roads, we were handed a Sonata equipped with a 2.0-litre naturally aspirated four-cylinder engine that won’t be available in Canada. We later had a chance to do a quick lap on Hyundai’s test track at its research and development centre behind the wheel of a 1.6T model—exactly like the one we’ll be getting. 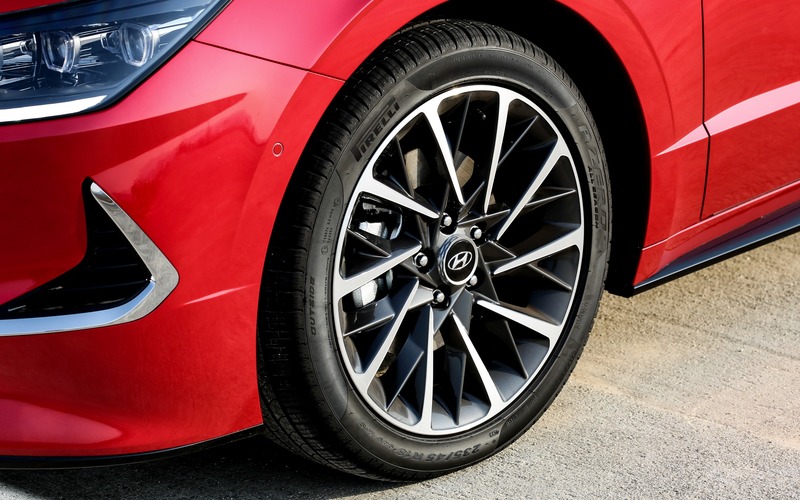 Right off the bat, we fell in love with the extremely rigid chassis of the 2020 Hyundai Sonata. Driving dynamics are pretty much flawless, except maybe for the fact that steering is on the light side. Handling is superb, thanks in part to our tester’s Pirelli P Zero tires, and the ride is quite satisfying. 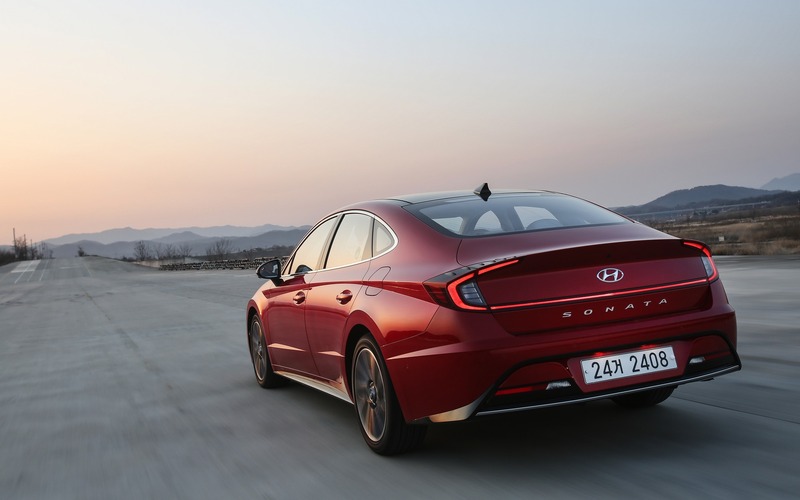 On the track, the turbo engine delivered on its promise, but it clearly won’t help the Sonata in comparisons with rivals that feature stronger engines. Our brief session also revealed a slightly firmer suspension on North American-spec models than on Korean units. When it comes to safety and connectivity, the 2020 Hyundai Sonata features a plethora of driver-assist technologies. However, since Hyundai Canada has yet to outline its sales strategy, we cannot confirm which of these will be standard or optional on the various trim levels. One thing is for sure: the new Sonata that’s heading our way will offer a parking assistant allowing you to move the car forward using the keyfob if there’s not enough space for you to enter. Conversely, you will be able to exit the Sonata and back it up remotely into a tight parking space. Cool, isn’t it? Come to think of it, one could argue the 2020 Hyundai Sonata has come full circle, returning to a more expressive design after five years of classic styling. Too bad we’ll have to wait for an indefinite period of time to get an AWD version or a hybrid powertrain.